Jenn Cleary's thoughtful reflection in her eclectic songwriting combines with her fun-loving musical performance to engage listeners in a funky celebration of breaking out and letting go, from sweet acoustic to beat drivin' rock and roll. Break loose. Take a chance. Ask the questions you haven't dared to before. 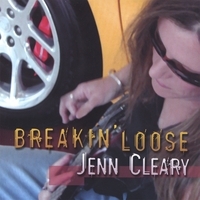 Rock artist Jenn Cleary guides her listeners through this process and more in her breakthrough album, Breakin' Loose. Leaping from playful tones to social critique and inquisition, Jenn Cleary rips apart the typical noise of female indie rock and inspires her fans to question their world and their own lives. The live-performance title track, Break It Loose, inspires audiences to tear from their chairs and get involved in the music. Forget about who you've been, seek a groove deep within. Listening to the song will not be a literal experience; in fact, it may alter lives. If nothing else, it will encourage listeners to deny their own restraints that keep them from living life to the fullest. No one can instruct this better than Jenn Cleary, who went through a dark period in her life when she was confronted with losing her eyesight. At this time, Jenn Cleary wrote her first song for this album, Down By The River, in which she asked herself, Why do I fear so? Can't I just let go? Trust where life will take me, trust where the river flows. Jenn Cleary, a Boston native, picked up the guitar at a young age and has been engaged in passionate performance ever since. She has been inspired vocally by greats such as Janis Joplin, Bonnie Raitt, and Joan Osbourn. You can hear the echoes of these artists, yet Jenn Cleary has her own unique sound and style, adding some freshness to today's music scene. Jenn Cleary's intriguing flair cannot be heard anywhere else. Let her music take you where you haven't been. Now's the time to release yourself; let go and break loose. Well, I dare you to not tap your foot during Little Yellow Sports Car! Jenn's music is both driving rock and mellow acoustic showing a great versatility and understanding of what makes the listener want to keep on listening. Combine that with a top-notch production quality and you have a cd that will make you want to Break Loose, too! Jenn's lyrics spring from her heart and soul--portraying her feelings about herself,her Dad,world peace and life in general. Well done. There is a real sense of inspiration on this CD. Jenn is successful at expressing her inspiration in the songwriting, and the performance is also inspired. Jenn has a beautiful smokey blues voice. I am most reminded of Janis Joplin, although this is in no way an imitation. Before you surf on by, check out "Peace In Our World," and "Little Yellow Sportscar." The music speaks for itself! I recommend this CD. Jenn Cleary writes good songs, and the arrangements and performances on the record are very good. Ricardo Pena recorded the cd, co-wrote some of the songs, and adds some smokin' organ and electric guitar tracks. Stylistically, the tracks range from electric blues to acoustic folk. My favorites are "I Need To Go", "Wish You'd Been Here To Stay", and "Down By The River". Bravo! Singer-songwriter Jenn Cleary's debut album is a lot of fun to listen to. She covers the spectrum of musical styles from rock to blues to a bit of country with a big dash of heartful singing in the mix. The theme of much of her original lyrics is transforming one's life through soulful expression. There's a nice balance of danceable songs and mood tunes. Check it out!